Sometimes when you upload content the thumbnail (or proxy) image that is generated is not too your liking or in some cases, Brandkit is not able to generate a thumbnail from the file (e.g. a Zip file). In these cases (in fact for any asset) you can manually upload a JPG, PNG or Gif as your thumbnail or Proxy image. Here's how. Navigate to the Asset you wish to update. 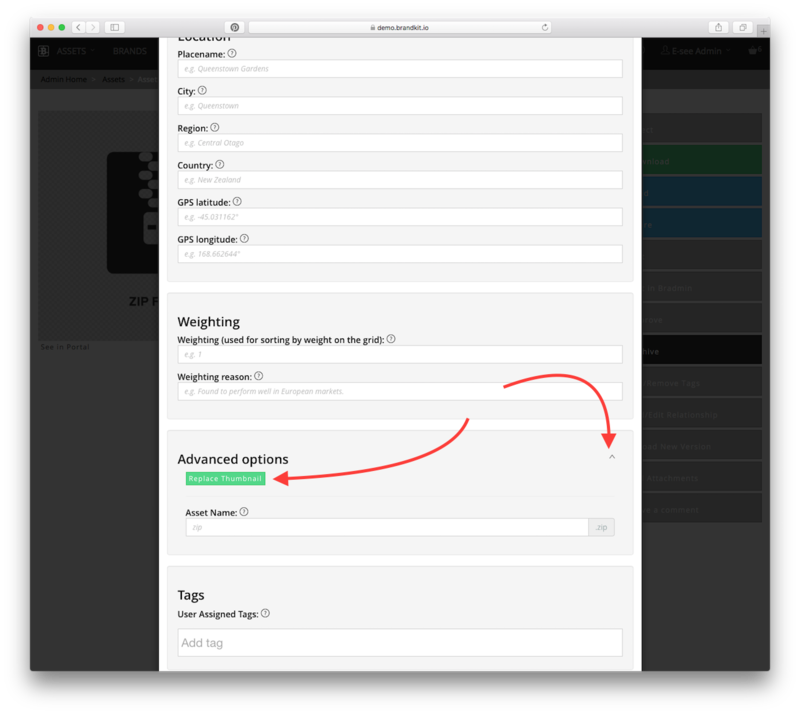 In the Edit modal window, scroll down to the Advanced options panel, and expand. Click the Replace Thumbnail button. The upload modal window will open, either select an Image from your computer or storage service or drag and drop a suitable image. It should be a web compatible (JPG,PNG or GIF) RGB image at 72dpi and 1280px on it's longest side (not bigger). Once uploaded, you can close the Edit modal window. Reload the page and check that your image looks right (you may need to allow a few seconds for the image to process).